It still amazes me that my only experience with the 4th Street Art & Music Festival up until last year was the unmistakable rumble of live music reverberating down Second Street during the Jersey City Artist’s Studio Tour. As quickly as it appeared, the following day, it was gone. Something cool was happening in my neighborhood, I just had absolutely no clue to what it was. Perhaps it was the party of all parties, and I was just too uncool to be slid an invite. No matter, there’s always next year. Last September, days before the studio tour, Mike Macnamera, one of the head honchos with the festival, showed up to our VNA meeting. He introduced himself, and invited the VNA to set up our tent for the festival. I liked this guy, and I was intrigued to see for myself what had for so long eluded me. It turns out this was no private party, and you don’t need a special invitation to attend. Hell, someone so lacking in cool as myself seemed to fit right in. This thing had everything – great music, food, funky art, and my kids had a blast. And the shocker, I was standing right in the middle of 4th Sttreet, in the heart of The Village. How is this happening? As the day progressed I quickly realized that Mike and the gang were on to something here. With the demolition of 111 First Street, and the once home to the Jersey City art scene, this cultural epicenter had splintered and found new homes, many of which are the store fronts and commercial spaces right here in the Village. This, I believe, is a blueprint for the future of The Village neighborhood. The meat and vegetable markets that so notably served the needs of this neighborhood for nearly a century, are nearly all gone now. But that infrastructure of street level store fronts, and even larger commercial spaces remain. The perfect setting for displaced artists to put down roots in which the growth of a community is inevidable. One such space is owned by artist and cultural pioneer, Frank Pailia. 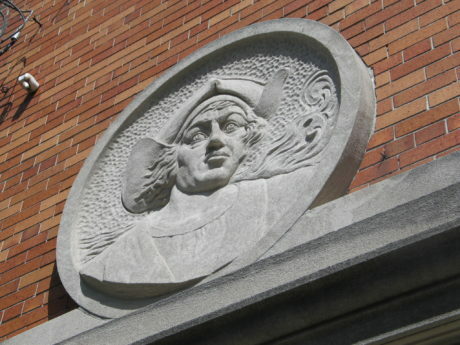 A former turn of the century firehouse, Frank purchased the 4xx Fourth Street in 1988, and his impact on the Jersey City art scene was felt soon afterwards. In 1989pp, in collaboration with several downtown artists, Franc began the very JC Studio Artists Tour that the 4th Street Festival is now a major attraction of. This same group of artists banded together soon afterwards to form Pro Arts, a non-profit group who’s mission is to support and promote local Jersey City artists. With Jersey City as his backdrop, and Fourth Street as his home, Franc soon put together a group of four artists, and began the city-wide mural project, painting murals, exhibiting, and curating in local spaces. The large Columbus Street mural is one such example. Though his move from Jersey City to Poughkeepsie, New York has been a gradual one (Franc still maintains a pied -a -terre apartment in the building), the vacancy of his studio space, and the groundwork he layed, set the stage for further cultural growth on Fourth Street. In 2001, Mike moved in. He set up his home and photography studio, and set up shop. Collaboration comes in many forms. As we were kicking around ideas last winter for a Village Neighborhood Assn.’s first annual Spring event, location was an obvious concern. Unlike the Van Vorst Park and Hamilton Park neighborhoods, we lacked that physical center and focal point that defines their identities, that being s park. Sure, Mary Benson Park is nearby, but in it’s current condition, and the fact that it’s primary use is punctuated by the baseball field smack in its middle, it was hardly the most ideal location. Remembering the sense of community I experienced as I stood on 4th Street last fall, I knew exactly who I should call. Mike not only welcomed our event to 4th Street, which grew into the monsterous Village Art and Flea Market, but 4th Street Arts became an official supporter. As steadfast liasian between city agencies, Mike not only helped us secure our neccessay permits and licenses, he became that all important bridge between The Village neighborhood and this emerging art community. The rebranding of a neighborhood is not a singular event. The historical significance of an area needs to be embraced as a community looks to redefine it’s future. One moment of last years 4th Street Festival stands out for me personally, and really illustrates the importance of neighborhood identity. At one point during the day i needed to head back to the house for some supplies. As i rounded the corner of Newark and Fourth, two hipsters with tattoos covering 80% of their bodies were approaching – one remarked to his buddy as they weaved their way through the crowd towards the festival- “They call this neighborhood The Village” – I smiled, that was music to my ears. It still amazes me that prior to last year, my only experience with the 4th Street Art & Music Festival was hearing the unmistakable rumble of live music reverberating down Second Street on a random weekend afternoon each Fall. As quickly as it appeared, the next day, it was gone. Something cool was happening in my neighborhood – I just had absolutely no clue what it was. Perhaps it was the party of all parties, and I was just too uncool to be slid an invite. No matter, there’s always next year. In September 2008, days before the Jersey City Artist’s Studio Tour, Mike “Mac” McNamara, one of the head honchos with the 4th Street Festival, showed up at our Village Neighborhood Association meeting. He introduced himself, and invited the VNA to set up our tent at their festival. I liked this guy, and I was intrigued to see for myself what had eluded me for so long. It turns out this wasn’t a private party, and you didn’t need a special invitation to attend. Hell, someone so lacking in cool as myself seemed to fit right in. This thing had everything – great music, food, funky art, and my kids had a blast. And the shocker? I was standing right in the middle of Fourth Street, in the heart of The Village. How is this happening? As the day unfolded, I quickly realized that Mac, and his trusted partner in crime, Marc Caterina, were on to something here. With the demolition of 111 First Street, once the home of the Jersey City arts scene, the arts movement of Jersey City had splintered and found new homes, many of which are store fronts and commercial spaces right here in The Village. Is this cultural shrapnel a future blueprint for The Village neighborhood? Why not? The live poultry and meat markets that so notably served the needs of this neighborhood for nearly a century, are all but gone now. Yet the infrastructure of street-level store fronts and even larger commercial spaces remain. The Village is a perfect setting for displaced artists to put down roots – a place where the growth of culture and community becomes inevitable. It is no accident that one such space has become the home of the 4th Street Festival. This converted century-old firehouse at 371 Fourth Street, home to Mac’s street level photography studio, has serious connections to Jersey City’s cultural past. Franc Palaia, artist and owner of 371 Fourth Street, purchased the former firehouse in 1988, and his impact on the Jersey City art scene was felt soon after. In 1989, in collaboration with several downtown artists, Franc began the same Jersey City Studio Artist’s Tour that touts the 4th Street Festival as one of its major attractions. This same group of artists banded together soon afterwards to form Pro Arts, a non-profit group whose mission is to support and promote local Jersey City artists. With Jersey City as his backdrop and Fourth Street as his home, Franc soon put together a group of artists and began the city-wide mural project, painting murals, exhibiting, and curating in local spaces. The large Columbus Street mural is one such example. Although his move from Jersey City to Poughkeepsie, New York has been a gradual one (Franc still maintains a Pied-a-Terre apartment in the building), the vacancy of his studio space and the groundwork he forged set the stage for further cultural growth on Fourth Street. Mike McNamara watches over the festival. There is no playbook when it comes to organizing civic and cultural events, especially in the city of Jersey City. The success and outcome of any endeavor is solely the result of the will and determination of those who have chosen to invest in it. These type of events don’t just happen on their own. For Mac, Marc, and the entire 4th Street crew, it is damn near a “Calling”. In 2004, Mac signed up to participate in the Jersey City Artist’s Studio Tour. His street level studio was perfect. So perfect in fact, that he decided to invite a few bands. It became a party, and marked the beginning of a new chapter for Fourth Street. Six years years later, with a roster of over 40 artists and nearly 20 bands, the festival has brought exposure to The Village in ways I’m sure Mac had never intended. Last winter, as we were kicking around ideas for The Village Neighborhood Association’s first annual Spring event, location was an obvious concern. Unlike the Van Vorst Park and Hamilton Park neighborhoods, we lacked that physical center and focal point that defines their identities. Sure, Mary Benson Park is nearby, but its current condition and the fact that its primary use is punctuated by the baseball field smack in its middle, does not make it the most ideal location. Remembering how I felt as I stood on Fourth Street last Fall, I knew exactly whom I should call. Mac not only welcomed our event to Fourth Street, which exploded into the monstrous Village Art and Flea Market, but 4th Street Arts became an official supporter. As a steadfast liason between city agencies, Mac had not only helped us secure our neccessary permits and licenses, but he became that all important bridge between The Village and the emerging arts community. The rebranding of a neighborhood is not a singular event. It takes time and persistence. Over the past few decades, The Village name has all but disappeared from the Jersey City vocabulary. But that has to change. As The Village slowly redefines itself with events such as the 4th Street Art & Music Festival, the historical significance of an area must continue to be embraced as a community looks to redefine its future. One small moment during last year’s festival stands out for me personally, and really illustrates the impact of establishing a neighborhood “brand”. At one point during the day, I needed to head back to the house for some supplies. As music filled the late afternoon autumn air, I crossed in front of the stage and rounded the corner of Newark and Fourth Street. Two hipsters with tattoos covering 80% of their bodies were approaching – one remarked to his buddy as they weaved their way through the crowd towards the festival – “They call this neighborhood The Village“. I smiled. That was music to my ears.